With skincare becoming the latest beauty fad, it’s getting harder and harder to find good information on the Internet. How do we know, when reading an endorsement, that the reviewer isn’t using the product for the first time? That they don’t have twenty others that they switch around? How do we know what to trust? We want to make that a bit easier for you this year on the Attic by committing to even more transparency, especially when it comes to what we’re putting onto our faces. We never want it to seem like we’re selling a product to you (none of our content is sponsored), and want to keep everything open to a discussion. To begin, we’re talking about what we do when the temperatures drop and the stress levels rise at this time of year. Skin can dry out or break out. Redness can come to the surface, and frustrations almost inevitably run high as everybody’s winter concerns are different and prone to changing as suddenly as the temperature. As I live in London, there’s nothing more important to me than preventing the pollution in the air from getting to my skin. SPF in my moisturizer is an absolute must. Additionally, as it’s getting colder, my lips are getting drier. I recommend the Dr. PawPaw original multipurpose balm; it’s a lifesaver and always in my bag in the colder months of the year. Winter is definitely the highest maintenance time of year for my skin. I have very sensitive skin and despite my childhood full of Chicago winters, my skin easily dries out with temperature drops if I’m not careful and consistent with my skincare routine. As I want to avoid looking both ill (constantly at a danger of turning gray in the wintertime) and flaky, I’ve perfected my regiment over the years. Once I’ve allowed the solution to sink in (if I’ve used it! ), I move on to the part of my routine that’s now set in stone. I use Kiehl’s Creamy Eye Treatment with Avocado under and around my eyes, and I’ve been doing that for the past ten years. I’ve tried other creams, but nothing lives up to it, and it’s incredibly moisturising. Then, I use their Ultra Facial Cream (with SPF during the day, though with that article and study that’s going around, I don’t know if I should be reconsidering this), which I’ve also been using for ten years. Again, I’ve tried others, including the likes of La Roche Posay and Avene and whatnot, and nothing works as well for my specific skin. A big jar of each of the Facial Creams (one with SPF and one without) lasts me a solid year, so I also feel that these are a better investment than any of the French counterparts I’ve tried so far! Finally, I finish things up with a facial massage with a rose quartz roller Rory gifted me for Christmas. It helps with my chronic muscular tension, and it’s a wonderful way to relax, work on my attempts at mindfulness, and allow the moisturisers to sink in. 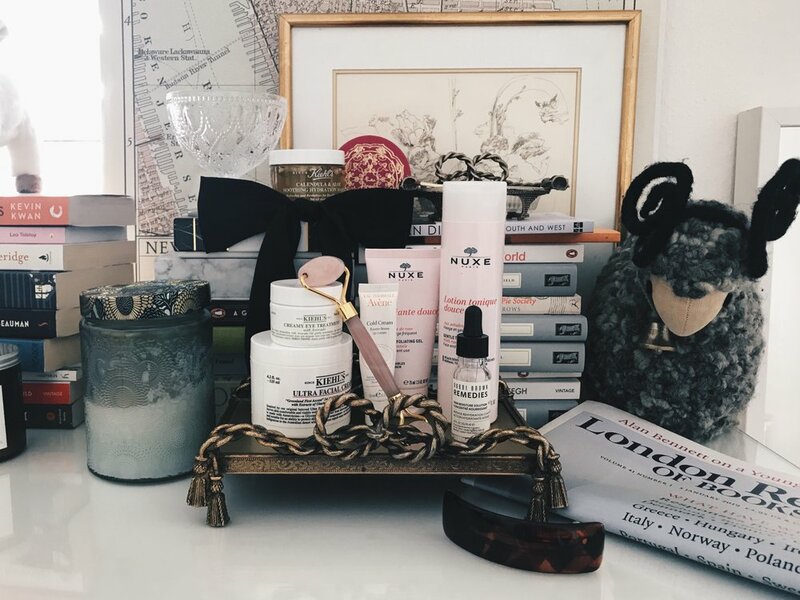 My routine is pretty haphazard in the winter—in my past heavily hormonal acne days it was very much sensitive, an issue I couldn’t have helped by piling on any and every acne product under the sun. What truly ended up changing things was realizing dairy is not my friend, and since parting ways my face has almost entirely cleared up, save for the odd stress pimple. However, this has left me in a weird, constantly changing place texture-wise. Nowadays, it’s somewhere between sensitive and combination, with odd winter days bringing dry patches on my forehead and around cheek acne scars, and oily patches around where my glasses sit and other areas of my nose. Winter in the Southeast States is a gamble; last year we had snow and this time, record highs of 80F. Humidity will lend a touch of moisture throughout the rest of the year but drops to nothing these months no matter where the temperature goes. My routine becomes more targeted in reaction. Where I’d normally keep the same low maintenance process to my whole face in the summer, winter has me exfoliating dry spots with The Body Shop’s Himalayan Charcoal mask. It’s a favorite, but when I can’t budget it I’ll pick up a few Yes To’s Tomato Charcoal Mud Mask packets. That one’s also got salicylic acid so it can be a help on acne days. I also like avoiding hot water by cleansing my face with Garnier’s micellar water instead of soapy washes as much as possible. My Woodlot toner is still going strong, (yay for all of the rosewater things!) and the hyaluronic acid in it keeps those spots needing less moisture in check while prepping drier spots for my heavier First Aid Beauty Ultra Repair Cream. This is probably the gentlest cream I’ve ever used and have loved it for years, plus the “antioxidant boost” listed on the label makes me feel healthy and like I’m actually doing something right. Seasonal allergies have left my eyes completely untreatable this season, so I just try not to rub them too much and hope my mother’s genes kick in soon so I can look 30 until I’m 50 as she has done. My skin has honestly been through the most in the past few years, thanks to a cocktail of meds I’ve had to be on for my chronic illness. With that in mind, I’ve had to put some serious time into balancing my skin out again, especially since I’ve gone from having generally normal, tending-toward oily skin to having quite dry skin in general. I use an oil-based honey cleanser by a local brand called Bee Natural, but also love The Body Shop’s Chamomile Cleanser — I find it incredibly soothing, and it manages to get my face clean without it feeling stripped and raw in the process. I follow up by misting my face with rosewater. I’ve recently started using LUSH’s Imperialis moisturizer, which has been a complete godsend. It’s sumptuous without being heavy, and hydrating while also being soothing. I would say that a little goes a long way though — if I use too much of it (I use about a pea-sized amount all over my face and neck), I tend to break out, but otherwise it’s made a huge difference in the overall radiance of my face. I tend to look older than I am (thanks to my very misspent youth), so at this point, anything that can restore some radiance and vitality has my undying loyalty and affection. It also smells wonderful, thanks to a healthy dose of orange blossom and lavender in its formula. Finally, for SPF, I’ll use good old Nivea Daily Essentials Moisturizing Day Cream. Its hydration is long-lasting, and thanks to it I seldom have to worry about any dryness or flaking as I run around from meeting to meeting in a very windy city. If I’m wearing makeup, I’ll mix a couple of drops of NUXE Huile Prodigieuse in with my foundation, which also does wonders for adding some more moisture and radiance, and giving a more natural finish to makeup. Every few nights, if my skin needs extra pampering, I’ll mix some jojoba oil with an essential oil that targets whatever I’m worried about at that moment (blue chamomile has done wonders for anti-aging and soothing), after exfoliating with a sugar and honey scrub and toning with rosewater. I grew up in the cold, wintry state of Michigan but am now living in Ireland, so my skin is still getting used to the damper climate, meaning that I don’t have to compensate as much now for the lack of hydration that my face used to endure. While I always make sure to stay moisturized, I also try not to layer it on too thick in the winter, because that occasionally leads to breakouts for me. Although my morning routine is quite sparse, I tend to bulk up at night to ensure that my products do their work overnight and I wake up feeling quite fresh and moisturized. I always use Clinique’s Pep Start eye cream followed by Dr. Jart’s Ceramidin Cream around the sides of my nose and between my eyebrows (my driest spots) and then all over my face with Kiehl’s Ultra Facial Cream. At night, after removing my makeup with Rituals Miracle Wipes, I tone my face and neck with REN Ready Steady Glow AHA Tonic, which smells beautifully citrusy. Occasionally I follow it up with some Rituals Anti-Aging Ampoule Booster (just a drop or two), which I got a mini version of for Christmas and will be buying in full when I run out, but I don’t use oil every day, just when I need that extra oomph. For my serum, I am particularly in love with the Ole Henriksen Truth Serum but I also have a mini of Caudalie Radiance Serum which is gorgeous. To top it all off, I use Caudalie Intense Moisture Rescue Cream, which isn’t too intense despite the name. It mixes flawlessly with the Radiance Serum and smells like a garden. We’ll never mention a product unless we truly love it. No material in this post is sponsored, but we may earn a small commission through some links to help in the running of the site.